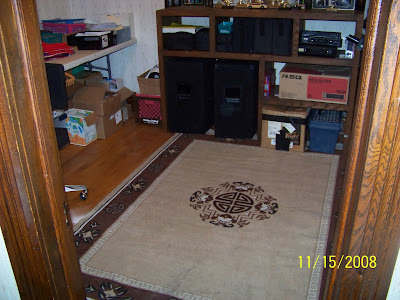 Because I have a carpeted floor in my kitchen now, I think one of these would be ideal. That way I wouldn't have to drag out the big ol' vacuum cleaner to pick up a few Cheerios or whatever else we happend to spill on the floor. 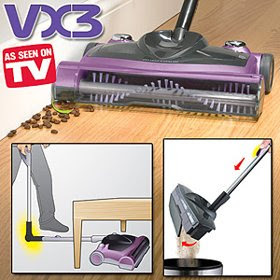 After all, they vacuum up nuts and bolts on the infomercial, so they MUST be good! This should also work great on the wood floors I have in my office and in all of the upstairs rooms. My husband is the AWANA commander at our church. Many a Wednesday afternoon, he has called me and asked if I would please make some kind of handout for the kids to bring home to their parents THAT night. 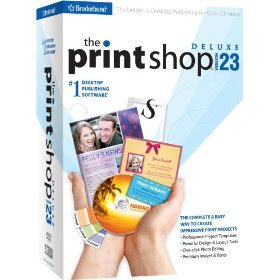 Therefore, it would be really nice to upgrade from my old Print Shop 12 to the brand new Print Shop 23! It would also come in quite handy for creating my own greeting cards or party invitations etc. I could have lots of fun with this. 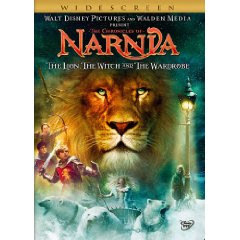 Ever since I was a kid, I have always loved the C. S. Lewis "Chronicles of Narnia" series. 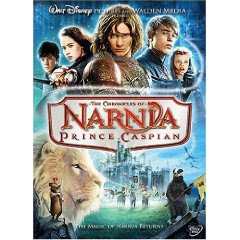 I've read almost all of the books at least once, and would really enjoy having DVD's of the two movies that are out so far, "The Lion, The Witch and the Wardrobe" and "Prince Caspian" which comes out on DVD this coming Tuesday, Dec. 2. I'm also really looking forward to the next big-screen Narnia adventure, "Voyage of the Dawn Treader". I can't wait! Everyone that knows me well, also knows that I am a "VeggieTalian". 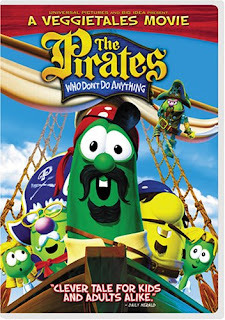 What's a Veggietalian, you ask? 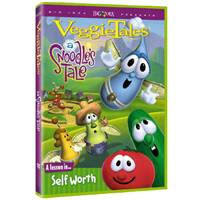 Why, it's someone like me, who is trying to collect every VeggieTales DVD ever made. So far, I am only missing two of the "VeggieTales Classics"; "Larry Boy and the Fib from Outerspace and "LarryBoy and the Rumor Weed. I actually do have one copy of each of these movies, but they are part of a 3 disc Larry Boy set, so I would love to have the individual DVD's of these two movies to complete my VT Classics collection. And then I'll probably give my 3 disc set to someone else. 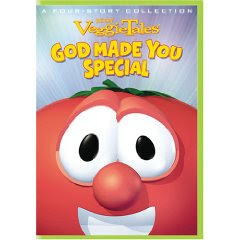 I am also missing "God Made You Special" and the brand new "Pirates Who Don't Do Anything" Movie that just came out on DVD in October. Oh and my copy of "A Snoodles Tale", (which really belongs to Molly), has seen better days and needs to be replaced. I don't think it will even play anymore. So there you have it, that's about all I can think of right now, other than world peace and good health, happiness, wealth and prosperity for my family and our friends. How 'bout you? What do you want for Christmas? 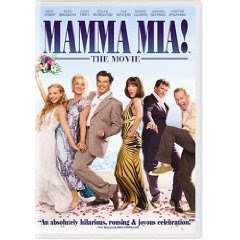 P. S. I was just informed tonight that "Mama Mia" will be out on DVD on Dec. 16th. I went to that with "the girls" for Sarah's birthday. We had so much fun! I wouldn't mind owning that one either. T - For the Turkey and all the Trimmings on our Tables Today. H - That my Hubby and I are not as Heavy and are much more Healthy these days. A - Because I am Anxiously Awaiting the Arrival of Jessica and CJ. N - For Nice November days above 70 degrees, (at the beginning of the month, when I started writing this). K - For all of our Kids...even when they drive us Krazy. S - For the Snowy Sign from God that told my dd not to re-enlist. G - That we have 3 Gorgeous Grandsons, AJ, CJ, and HD. I - For the Incredible Internet, that allows us all to keep In touch this way. I - That nothing is Impossible with God! Even If it seems so at times. N - For New Neighbors ...and Not being too Near to them, Now that we moved. G - That I am able to Get closer to God each and every day. S - For every Soldier and Service person keeping our country Safe. 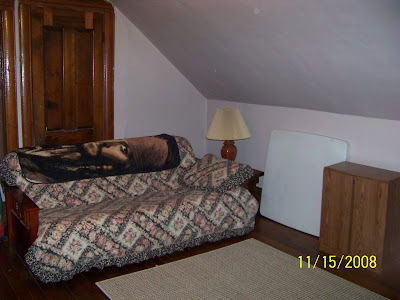 Ray and I have been busy creating a warmer and cozier home this past weekend. We bought some new curtains for the living room, which he hung for me. He finished up hanging the other curtains that were on his "honey-do" list from last weekend, and we put poly over all the windows on the main floor so far. That should help with some of the draftiness in this old house. The back door simply needs replacing, you can see daylight around it. I'm going to have to talk to the landlord about that one. 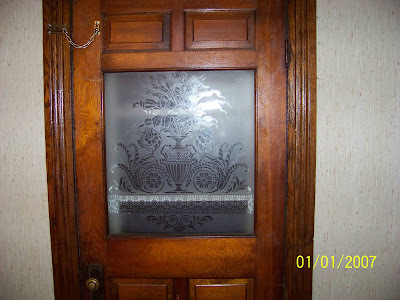 There's a lot of cold air coming in under the front door too, but it's such a pretty old door, that I wouldn't even want to replace that one. Hopefully, stuffing some insulation in between the doors will help. Other than that, we haven't been doing anything exciting lately. That's a good thing sometimes. 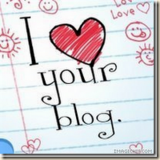 Very shortly, we will have a four year old running around the house, which should give me lots more "blog fodder". Well, I'm off to my bible study for "Frazzled Females". Have a great day! 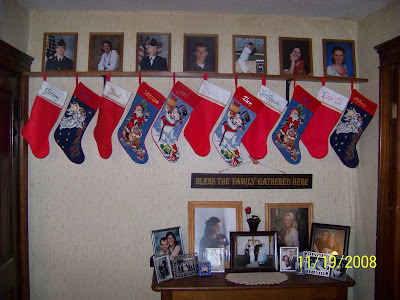 WW #10 ~ The Stockings Were Hung From The Shelf With Care? Again. I guess maybe I've been practicing my maintenance lately for when I actually get to my goal weight. I have been kind of on a plateau for quite a while here. In fact, I haven't gone to WW for two weeks, but the scale was EXACTLY the same as last time. That means I am STILL .6 lbs away from the 40 lb. mark. I was really hopeful this time, because my home scale said I was exactly 40 lbs lighter, but their scales obviously don't weigh exactly the same as mine does. Oh well, I'll just keep plugging away at it. I'd really like to break that 40 lb mark before Thanksgiving week, so I'll try really hard this week and probably weigh in next Monday again. Now that things have settled down around here, maybe I can be better about writing down everything I put in my mouth. That oughta help. And maybe I should just stay home all next weekend, that seems to be when I do the most damage to the scales. New And Improved Farmhouse Virtual Tour ~ Now With Furniture! For the past couple of weeks, I have been unpacking boxes, trying to find a place for everything, (so that everything can be in its place) and working on a "honey-do" list for my husband. I now have MOST everything the way I want it, and Ray has decided to take the day off from "work" and work on my list, he's about halfway through it now. Anyway, this is what the place looks like so far. A friend of mine says our old brick farmhouse reminds her of a gingerbread house, and this just happened to be hanging outside the backdoor when we moved in. Mr. and Mrs. 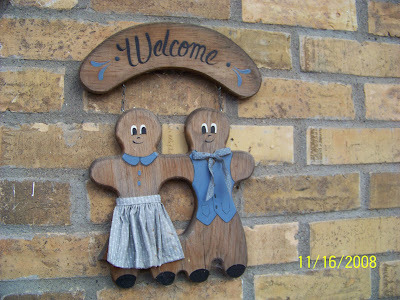 Gingerbread welcome you. Come on in, shoe removal is not necessary, but feel free to do so if you'd like. Just watch out for my 40 lb attack frog below the gingerbread couple. Just inside the entryway, off the kitchen to the right is THE bathroom. I'm finally getting used to only having one again. 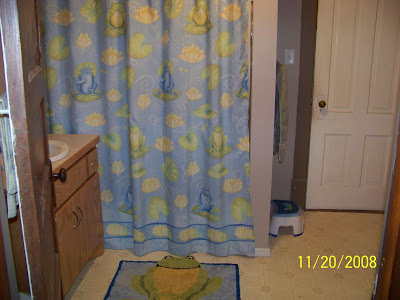 All of my bathroom frogs hopped right in and made themselves at home. They seem to really dig their new "pad". And look, I even found a box of tissues with frogs on it! And you see that door right there? That leads to the dungeon basement, of course. 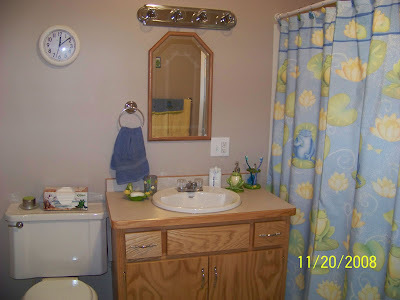 Doesn't everyone have a basement door in their bathroom? 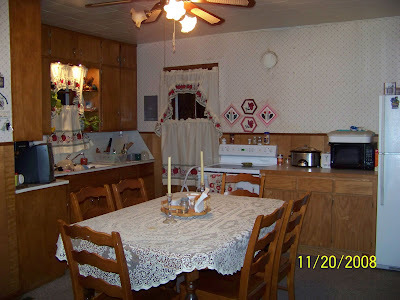 Now, step back out of the bathroom, into my country apple kitchen: Quaint, don'tcha think? One of the things on the "honey-do" list was to put this table together and get rid of the oval one I had in the kitchen before. Another was to tighten up our extremely wobbly chairs, so they wouldn't fall apart and land someone on the floor some day. He's got those two checked off, yeah! 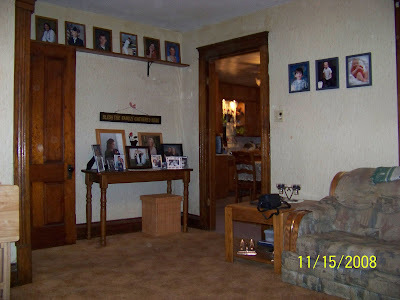 The kids and the grandkids were the first ones to move into this house. Well, at least their pictures anyway. That high shelf is supposed to be for plates or something I guess, but it works great to set our 7 kids on, and I didn't even have to try to get them all level that way. Everyone should try to raise "level-headed" children, right? So far, we have 3 grandsons. 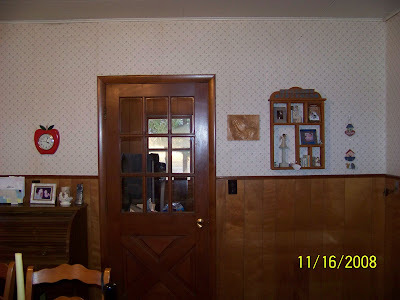 If we end up with more grandkids than will fit on that wall someday, I have one more empty wall I can use. See? 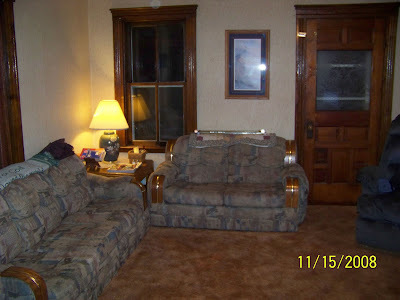 I had originally put the love seat in front of the front door, (which has a beautiful etched glass design in it), because we don't really use that door anyway, but the "feng shui" didn't feel right to me. Not that I'm into that sort of thing, it just didn't look good with the door blocked. At least this way, we will be able to get out of it easier in case of emergency. 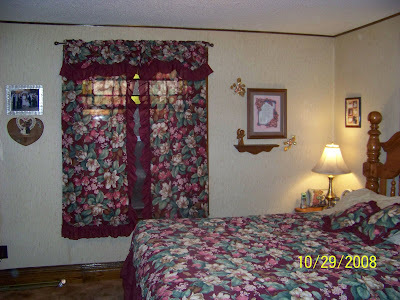 Try not to notice that the curtain rods are still sitting on the back of the love seat. They're on his list...he just hasn't gotten to them yet. His side. Yes, the buck stops here. This picture doesn't even do it justice, the wall is really curved. 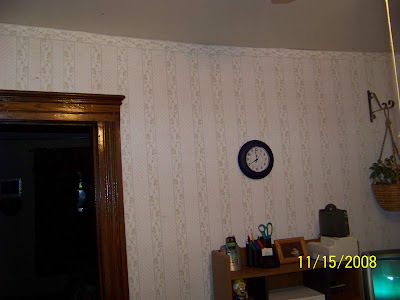 In fact, if you look back at the "his" side of the bedroom pic, next to the dresser, you can see the angled corner on the other side of this strange wall. I'm not really sure what they were thinking when they built it that way, but it's one of the things that gives this old house its charm and character. I was going to give the teddy bear toddler bed away, but I talked to CJ while we were moving and he said, "Grandma, are you going to bring the little bitty bed to your new house?" I asked him if he wanted me to, and he said yes. Now I'm glad I kept it, since they're going to be staying with us for awhile. Molly was big into "The Lion King" as a toddler. Can you tell? 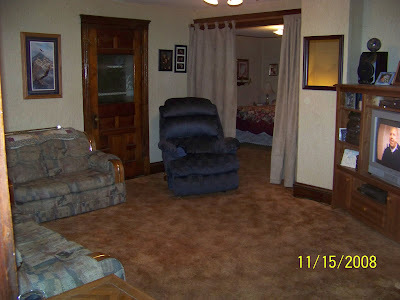 The door to the left, is our "TV room". Molly's big into "Captain Jack Sparrow" these days, can you tell? 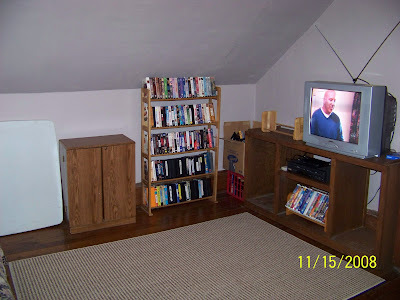 Below, you'll see the bottom half of the same entertainment center from the office, upstairs. You can probably figure out why we couldn't use the top of it up here. Not without cutting one side of it off anyway. Don't ask me what the heck was on TV, I have no idea. Now, here's my favorite part of this room. 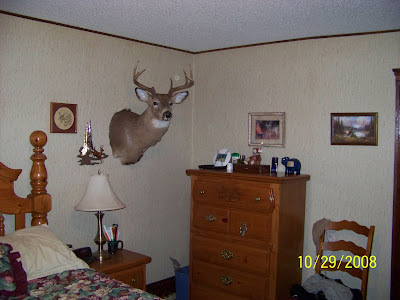 Again, I didn't know when I put all this here that my grandson was moving in. 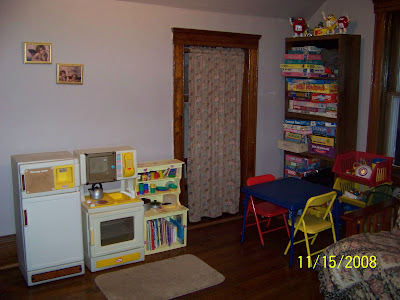 I just like to have a kid-friendly place for the grandkids (or any other little visitors that come to my house), to play. 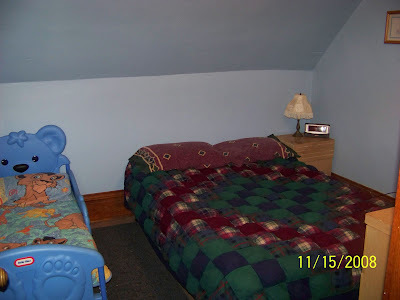 Seeing as how Molly's room is not "picture-ready" yet either, I will end today's tour here. I hope you had fun on my new, improved virtual tour, and if you're a friend or relative that hasn't visited in person yet, feel free to come on over for real. Just call first, and I'll put the coffee on for you. My "Moll", Almost the Tallest of Them All! 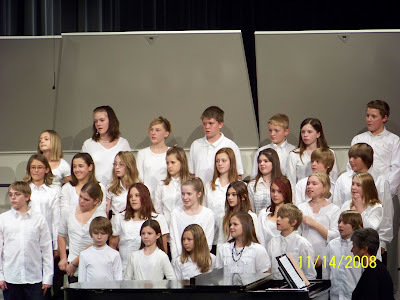 Molly had her first 6th grade choir concert last night. Ray wasn't able to attend, because he had a deadline to finish at work. He really wanted to be there, so I told him I would record it for him. I usually dread these things, mostly because it's almost impossible to find a place to park and to sit etc., and I wasn't looking forward to going all by myself. But last night I found a parking spot (less than a mile away), in a matter of minutes and there were plenty of places to sit when I got there too. Although the concert itself didn't last more than half an hour, it was really pretty good. Short and sweet. Molly, (6thfrom the right in the back row), has been the tallest, or 2nd tallest kid in her class for at least the past couple of years. Right now, there is only one boy, (the one in the righthand corner), that is taller than she is...and apparently not by much. Molly doesn't seem to be self-concious about it though, like I was when I reached my full height, (about a 1/2 inch shorter than she is now), so that's a good thing. As a matter of fact, she wanted me to buy her some new black shoes with FOUR INCH HEELS! That would only make her 6 feet tall. Ummm...no. Molly already towers over almost everyone, and I also didn't want to see her trip and break her neck while climbing to the top of the risers on the stage. I did buy her a cute new pair of flats because with all of this growing she's been doing, her feet have grown too. This video is of the song "Hey Noah!" I'd never heard it before, but it was kinda cute. This is the only good picture I happen to have on this computer of Ruth. She's Ray's youngest daughter, and our second youngest kid all together. It's hard to believe that she was actually younger than Molly is now when I met her! Have a great birthday, Ruth! I hope you and Dan were able to go out and celebrate sometime tonight. Now I'm The One Jumping For Joy! I used this picture once for a Wordless Wednesday, but I'm re-posting it because it sort of describes how I feel at the moment. 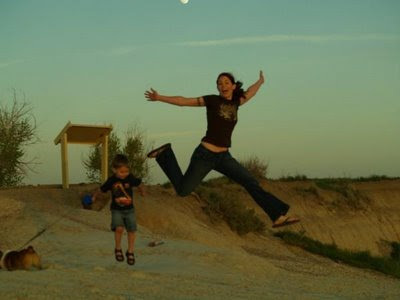 The two people in the picture are my daughter, Jessica and her son, CJ. Jess has been in the USAF for the past 6 years. She was planning on re-enlisting for the next four years, and moving herself and my grandson to the state of Georgia. That is, up until this past Thursday, (the day she was actually supposed to do the re-enlisting), when she woke up to all that snow that I posted about a few days ago. The whole Air Force base was shut down during blizzard-like conditions, and she wasn't able to go anywhere that day. She called me and said she thought that this was a pretty sure sign from God that she wasn't supposed to re-up for another 4 years. 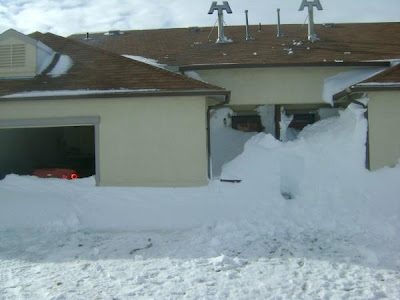 She didn't even get her car dug out until sometime on Saturday. I didn't really believe she was serious about not re-enlisting, but I was sort of hoping so in the back of my mind. We have 3 grandsons. 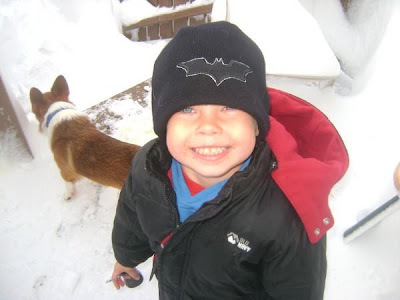 There is 5 1/2 year old "AJ", who lives with his dad, (my son Jeremy), in Arizona. Little "HD" who will be 1 year old on Dec. 23 lives with his mom and dad, (Ray's son, Dan and his wife T.) in Oregon. And then there is "CJ", who just turned 4 a couple of weeks ago. I sometimes feel more like a second mom to him than his grandma. He lived with us for 5 months while Jess was doing her tour of duty in Iraq. We had him from the time he was 10 months old until he was 15 mos. old. Which means he was with us for his 1st birthday, his first toddling steps, and probably a few of his first words too. That was all really hard on his mom, but Ray and I got pretty close to the little guy while he was with us. For the past couple of years, Jess and CJ have lived in Rapid City, SD, (which is far enough from us already here in central MN), but we could get there in a day's drive at least, if we wanted to visit them. I was NOT looking forward to them moving all the way to GA! If we had all kinds of money, it might be fun to travel to three different corners of the country to visit the kids and grandkids...but unfortunately we do not. Anyway, she called me tonight and asked if they could live with us. Of course, I said yes! Not that it would be a permanent situation, but at least until she can find a job, and an apartment for them. I'm so excited! She gets out in early December, and then she is DONE. I'm proud of my kids for serving their country in the military, but I think 6 years is enough. I'll have them home for Christmas! I never thought I'd say this in a million years, but Thank You, GOD for the SNOW! My daughter, Jessica called on Wednesday night and told me they were in the middle of a blizzard where she lives near Rapid City, SD. 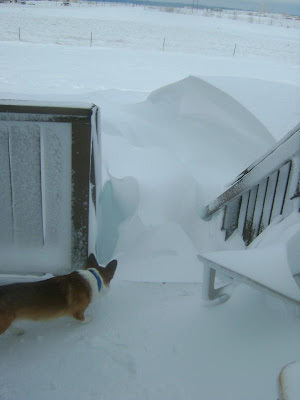 I know we got a little bit of "Snizzle" today here in central MN, but this is what my daughter and grandson woke up to yesterday: The door on the left-hand side is her front door. That is the back of her car in the garage. 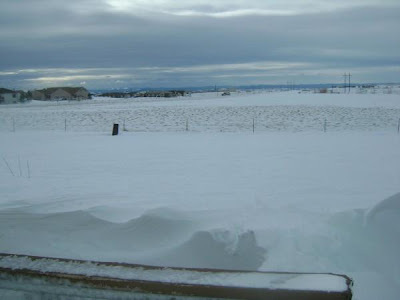 She said there was not that much snow in most places, but it all seemed to drift in just outside of her front door. She was able to get out through the garage, but is still not able to go anywhere. 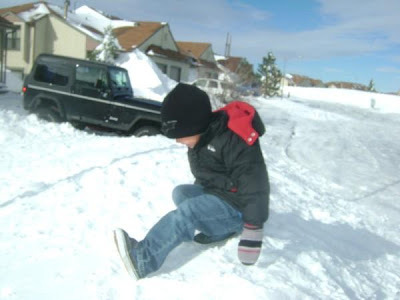 Here is my grandson, CJ playing in the middle of the street, on a huge snow drift. Obviously, he doesn't have to worry about traffic, since no one is able to get through. This is her short-legged dog, Bart, trying to figure out how to get down the stairs off the deck. I'm pretty sure she just let him do his business right there on the deck. 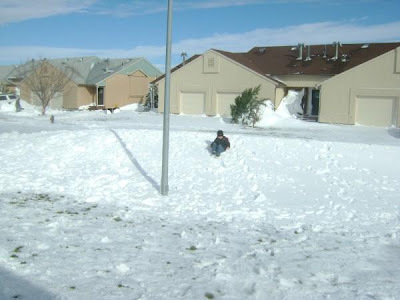 He'd surely get lost in all that snow. And one more parting shot of my grandson, CJ, just because he's so cute and this grandma misses him so much. He seemed to enjoy playing in the snow, even if it was only November 5th. 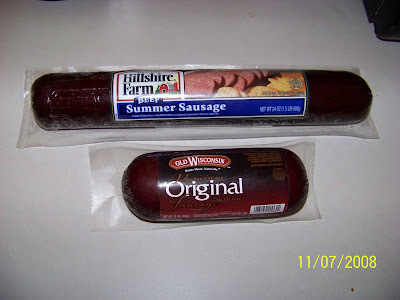 Which of these two summer sausages would you rather buy??? The one on the top is all beef and weighs in at 24 oz. I picked it up tonight from Walmart for $5.47. The one on the bottom is a whopping 12 oz., is made of beef and pork products and was purchased for $9.50 by my husband's aunt from the school fundraiser that my daughter's school put on. Every time I have ever allowed any of my children to participate in these ridiculous rip-offs, I have been thoroughly embarrassed to deliver the products to the friends and family that were gracious enough to want to support my child's school, once we get them. I understand the whole fundraiser thing, and generally speaking, yes, you do end up paying double what you would in a store...but this is really insane. Half as much product for almost twice the price...and to top it off, it's not even all BEEF! Well, I decided to go weigh in tonight even though I had decided to weigh in every other week. I had gotten on my home scale and was encouraged. It appeared I was actually down close to 40 lbs total. I was down CLOSE to 40lbs! To be exact, after losing 1.8 lbs this week, I'm down a total of 39.4!!! I just can't seem to break that 40 mark, but then it took me a LONG time to get over the 20 lb and 30 lb marks too, for some reason. Honestly, I have no idea why I lost anything at all this week. Let's see, I had McDonald's, DQ, Pizza Hut, Halloween candy...a rootbeer float at church...and probably more that I shouldn't have. I'm pretty sure it has to do with moving and staying up all night last night to get it done. My hubby and I had to get everything out of the house and garage before today. We had some wonderful help during the day on Sunday. Ruth and her hubby Dan are still here, so they were a big help, (especially to Ray with all of his stuff), and then, after church, our friends Lisa and Donnie called and asked what they could do to help. After we'd all had our lunch, I called her and they, (along with three of their older kids), met us at the old house. Not only did they help us with getting things packed up, but when we delivered the refrigerator they were buying from us to their house, they invited all 5 of us in to join the 8 of them for a wonderful dinner of pot roast and potatoes and corn, before bringing a load out here to the farm and helping us unpack it. You can't beat that, can you? Thank you, thank you, thank you!!! You were a real blessing, all of you. At about 10:00 last night, Ray and I decided to go back to the house alone. I really wanted Molly to go to bed, and figured the other two were awfully tired anyway, after all the moving they'd already done for us the past two days. So they might as well stay here with her and go to bed too. We were hoping to get everything in one load. Yeah, right. It didn't seem like I had much left in the house, but I'm pretty sure it was a full van-load. We were both driving vehicles, each with a trailer in tow, but we still didn't have enough room for what was left. We brought that load back and went back for another. By then, all that was left was the garage stuff...but if you know Ray...that's a LOT of stuff. I lost track of how many trips we made after that, but by the time we got back to the farm the 2nd or 3rd time, it was going on 5am! We were both exhausted and my body hurt so bad I could hardly move. Ray was running on empty by then too, but he told me to go in and go to bed and he'd make ONE more trip. He did, and he pulled in the driveway at about 7:00 AM! He never did go to bed, he and the kids went off to work. I went back to sleep for a few hours after they and Molly left. He's now sleeping in his favorite place, (sitting up on the couch), and I'm pretty sure I won't get him to move until morning. But we're officially here. Holy Tricks and Treats, Batman!! 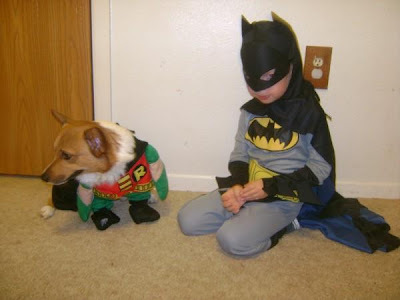 This is my 4 yo grandson, CJ all dressed up for Trick-or Treating with his trusty sidekick, the "dog-wonder", Bart. They didn't actually take the dog along, because with that costume on, Bart's legs aren't long enough to reach the ground. They are pretty cute though. 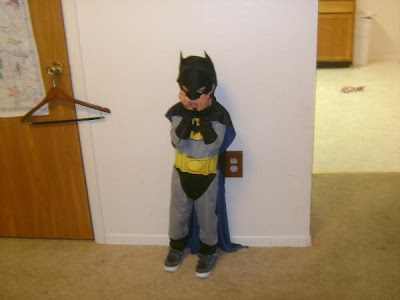 Batman doesn't look too happy here. Perhaps because his trusty sidekick isn't with him?